In the United States, deodorant and antiperspirant sales are in the billions, indicating most Americans purchase them to treat odor and sweating under the arms. Antiperspirants attempt to reduce sweating temporarily and deodorants attempt to mask odor. The active ingredient in most antiperspirants is aluminum. The aluminum collects in your sweat glands, temporarily blocking them, reducing sweating. However, deodorants are just a specific type of perfume application for the underarm area that works as a “band-aid” but not a solution for odor. Interestingly, there has been a lot negative press in recent years reporting that aluminum can be linked to a number of diseases. There is no definitive evidence to show a direct correlation, however many of our patients report a number of rashes or allergic reactions to antiperspirant use and sometimes even hyper pigmentation from chronic irritation. Those who don’t observe an allergic reaction, tend to notice that a tolerance to the antiperspirant builds over time. Imagine being free of embarrassment whether you’re walking the red carpet, at an important business meeting, or just meeting someone new without worrying about sweat stains or odor. 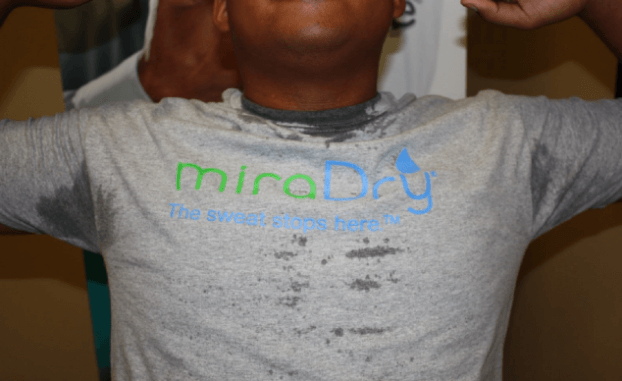 MiraDry uses electro-magnetic energy to permanently reduce underarm sweating, up to 80%, 75% of underarm hair, and greatly reduce odor in 1-3 treatments. The treatment leaves your underarms dry, smooth, and almost completely odor free. Dr. Kathleen Welsh was the first physician in the country to purchase the miraDry machine in 2011 and has received the treatment herself. It has permanently changed her wardrobe choices, as well as how she lives her life. Now Dr. Welsh doesn’t have to worry about how a type of fabric or a stressful situation might cause sweat stains. This means you could wear your favorite silk gown to the symphony opening night gala or that fashionable synthetic fiber blouse to the big business meeting without any fear. MiraDry is a life-changing procedure for many of our patients, I feel lucky to be able to provide it. If you are interested in the treatment please contact Bay Area Cosmetic Dermatology : 415-292-6350. If you have any specific questions or would like a consultation for the treatment please contact me at [email protected].